« Resilience: The Great Lie? Coming from a fairly standard T1 set, the warlock tier 2 was a pretty radical departure for its time. 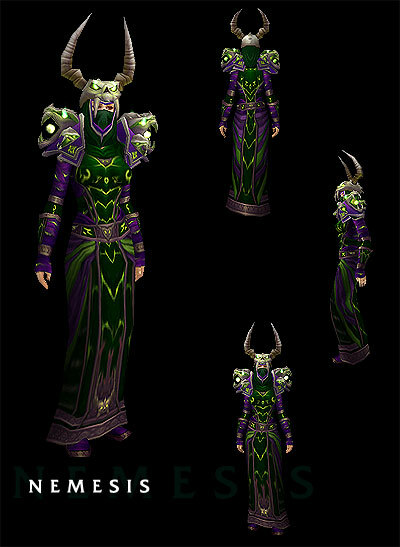 Highlighted by a contrasting purple and green color scheme, some hellish (but oddly cat like) shoulders and truly wicked helm horns, the Nemesis set was unmistakably warlock and arguably the most unique of any of first two tiers released. Few would argue that Warlocks have, over the years and through many tier sets been given the best looking sets and I maintain that the Nemesis set was the start of this trend. In hindsight the warlock tier 2 might seem a little tame in comparison to some of the crazy sets that would be released in later tiers, but even today, Nemesis shines. This set also has the distinction of being the first set to give Warlocks green fel-fire, which is of course is highly desired by all manner of dark art practitioners. This entry was posted on May 27, 2011 at 9:49 pm and is filed under General, MMO, Role Playing, World of Warcraft. You can follow any responses to this entry through the RSS 2.0 feed. You can leave a response, or trackback from your own site.